CHICAGO, March 21, 2019 /PRNewswire/ -- Today Conagra Brands, Inc. (NYSE: CAG) reported results for the third quarter of fiscal year 2019, which ended on February 24, 2019. All comparisons for Legacy Conagra results are against the prior-year fiscal period, unless otherwise noted. Certain terms used in this release, including "organic net sales," "Legacy Conagra," "pro forma," "EBITDA," and certain "adjusted" results, are defined under the section entitled "Definitions." Net sales grew 35.7%, driven primarily by the Pinnacle Foods acquisition. Organic net sales excluding the sale of the Trenton, Missouri production facility (Trenton) increased 1.9%. The Grocery & Snacks segment grew net sales by 2.9% behind continued strong performance in the Legacy Conagra snacks business. The Refrigerated & Frozen segment continued its positive momentum in the third quarter, with net sales growth of 3.3% and organic net sales growth of 2.4%, driven by innovation. Diluted earnings per share (EPS) from continuing operations was $0.50, and adjusted diluted EPS from continuing operations was $0.51 in the quarter. Solid operating performance in Legacy Conagra continued. Taxes, interest expense, and lower joint venture earnings associated with Legacy Conagra in the quarter, and the dilutive impacts of Pinnacle, reduced overall EPS. The Company's integration of the Pinnacle business, which was acquired in October 2018, remains on track. The Company realized approximately $12 million of cost synergies in the quarter and continues to expect to exceed its previously-announced $215 million cost synergy target. As of today, the Company has reduced debt by $685 million since the end of the second quarter. With approximately two months remaining in the fiscal year and the Wesson transaction complete, the Company has updated its fiscal year 2019 outlook, including reaffirming its guidance for adjusted diluted EPS from continuing operations. The Company will host an Investor Day on April 10, 2019 in Chicago where it will share more information on the value creating opportunities ahead, including an update on its robust innovation slate, Pinnacle cost synergy opportunities, and the Company's long-term financial algorithm. Sean Connolly, president and chief executive officer of Conagra Brands, commented, "Our Legacy Conagra business generated solid growth during the third quarter and delivered strong performance in our domestic retail segments. We saw continued improvement in consumption trends and base sales velocity, and organic net sales grew nearly two percent during the quarter. Our brand building and innovation actions over the past several years have resulted in strong growth in our frozen and snacks portfolios, and we remain focused on applying this disciplined approach across our portfolio." He added, "The integration of Pinnacle Foods, and the reinvigoration of its innovation pipeline, remain squarely on-track. We are aggressively applying our proven 'Conagra Way' to address the executional challenges in the Birds Eye, Duncan Hines and Wish-Bone businesses. While it will take some time to return these Pinnacle businesses to growth, we are confident that we have identified the issues and have the right action plans in place to improve the performance of these terrific brands. We have tremendous confidence in the long-term value creation potential of Conagra Brands and look forward to providing a comprehensive update at our upcoming Investor Day on April 10." The 1.9% growth in organic net sales, excluding Trenton, in the quarter was largely in line with expectations. These results reflect a 1.2 percentage point increase in Legacy Conagra volume. 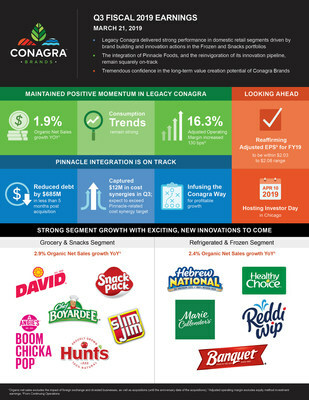 In addition, price/mix improved 0.7 percentage points in the Legacy Conagra business as favorable pricing and mix were partially offset by increased investments with retailers to drive brand saliency, enhanced distribution, and consumer trial. The Company estimates the organic growth rate was reduced by 1.4 percentage points due to the increase in brand building investments with retailers, which was funded by reductions in certain lower-return advertising and promotion (A&P) investments. Gross profit increased 25.6% to $752 million in the quarter. Adjusted gross profit increased 30.5% to $781 million, or 28.9% of net sales. The addition of Pinnacle's gross profit, together with supply chain realized productivity and improved price/mix in the Legacy Conagra business, more than offset higher transportation and input costs as well as the previously-mentioned brand building investments with retailers. Pinnacle's gross margin performance in the quarter was dilutive to the Company's overall gross margin, and the shift from A&P expense to brand building investments with retailers reduced gross margin by approximately 100 basis points. Selling, general, and administrative expenses (SG&A), which include A&P expense, decreased 5.1% to $334 million in the quarter. Adjusted SG&A, which excludes A&P, increased 23.4% to $274 million, primarily as a result of the addition of expenses associated with the Pinnacle business, partially offset by lower incentive compensation expense due to a lower stock price compared to the prior-year period. The Company's A&P expense decreased 13.9% to $67 million in the quarter as the Company continued to shift brand investments in the Legacy Conagra business from certain lower-return A&P marketing investments to brand building investments with retailers. Net interest expense increased $91 million to $131 million in the quarter. The increase was primarily driven by higher levels of debt outstanding compared to the prior-year period, which was largely a result of the net debt incurred in connection with the Pinnacle acquisition. The average diluted share count of 487 million shares reflects an increase of 85 million shares versus the prior year period. The increase was driven by the shares issued in connection with the Pinnacle acquisition, partially offset by share repurchases executed during fiscal 2018. In the quarter, net income attributable to Conagra Brands was $242 million or $0.50 per diluted share. Adjusted net income attributable to Conagra Brands was $251 million or $0.51 per diluted share in the third quarter, as compared to $245 million and $0.61, respectively, in the prior-year period. The increase in adjusted net income attributable to Conagra Brands was driven by higher operating profit, which was partially offset by higher interest expense, a higher tax rate, and lower earnings in the Ardent Mills joint venture. The decrease in adjusted diluted EPS from continuing operations was primarily driven by the previously-mentioned increase in share count. Adjusted EBITDA, which includes equity method investment earnings and pension and postretirement non-service income, increased 35.9% to $554 million in the quarter, driven by the addition of Pinnacle's operating profit and growth in Legacy Conagra's operating profit. Net sales for the Grocery & Snacks segment increased 2.9% to $863 million in the quarter. The Company's focus on building a strong snacks business delivered strong results in the quarter. Net sales of businesses in the snacks portfolio grew 8.2%, led by Orville Redenbacher's, Act II, Snack Pack, Slim Jim, and Duke's branded products. Volume increased 2.1% behind the strong growth in snacks, and price/mix increased 0.8% in the period as favorable pricing and mix more than offset increased brand building investments with retailers, which were funded by shifting dollars from A&P. Operating profit for the segment increased 10.2% to $194 million in the quarter, and adjusted operating profit increased 9.8% to $196 million. Net sales growth, lower SG&A, and the benefits of supply chain realized productivity more than offset higher transportation and input costs. Net sales for the Refrigerated & Frozen segment increased 3.3% to $711 million in the quarter, and organic net sales grew 2.4%. The acquisition of Sandwich Bros. of Wisconsin, which closed late in the third quarter last year, added 90 basis points to the net sales growth rate. Volume grew 3.5% behind strong growth across the frozen portfolio, including the Marie Callender's, Healthy Choice, Banquet, P.F. Chang's, and Frontera brands. Price/mix decreased 1.1% as favorable pricing and mix were more than offset by increased brand building investments with retailers, which were funded by shifting dollars from A&P. Reported and adjusted operating profit both grew 4.2% to $131 million and $132 million, respectively. Net sales growth and realized productivity more than offset unfavorable price/mix, higher SG&A, and higher transportation and input costs. Net sales for the International segment decreased 11.4% to $198 million in the quarter. The sale of the Canadian Del Monte business reduced the net sales growth rate by approximately 640 basis points, and the impact of foreign exchange unfavorably impacted the net sales growth rate by 415 basis points. Organic net sales decreased 0.9% as favorable price/mix of 1.1% was more than offset by volume declines, concentrated in certain lower-growth global markets, of 2.0%. Operating profit decreased 15.0% to $25 million in the quarter. Adjusted operating profit decreased 13.0% as the impact of higher input costs, increased A&P investments, and the Canadian Del Monte business divestiture more than offset favorable price/mix and lower SG&A. Net sales for the Foodservice segment decreased 8.7% to $223 million in the quarter, and organic net sales excluding Trenton decreased 0.6%. The sale of the Trenton facility reduced the net sales growth rate by 810 basis points. Price/mix increased 6.1% and volume declined 6.7% in the quarter as the segment continued to execute its value-over-volume strategy. Operating profit increased 21.5% to $29 million in the quarter, and operating margin expanded 326 basis points. The impacts of favorable price/mix, supply chain realized productivity, and lower SG&A were partially offset by the impacts of higher input costs and the sale of the Trenton facility. Net sales for the Pinnacle segment totaled $712 million in the period, which reflects a mid-single-digit percentage point decline versus the comparable year ago period on a pro forma basis. As expected, consumption declined during the quarter. Consumption growth in brands including Vlasic, Armour, and Gardein were more than offset by declines in brands including Birds Eye, Wish-Bone, and Duncan Hines. Additionally, the segment's year-over-year performance was negatively impacted by this year's later Easter holiday. Operating profit for the Pinnacle segment totaled $102 million in the period, and adjusted operating profit was $130 million. This performance, which was above expectations, was driven by lower than expected SG&A as well as approximately $12 million of synergies that were delivered ahead of schedule. Additionally, $19 million of adjusted corporate expenses related to the acquired Pinnacle business have been accounted for in the Company's total corporate expenses and not in the Pinnacle segment. This was in line with the Company's expectations. The overall integration of the Pinnacle business remains on-track, with people, process, and systems integration workstreams achieving planned milestones. The Company has also made significant progress reinvigorating Pinnacle's multi-year innovation pipeline with a focus on Birds Eye, Duncan Hines, and Wish-Bone. Corporate expenses decreased $46 million to $63 million in the quarter. Adjusted corporate expenses increased 20.3% to $73 million in the quarter, $54 million of which is related to Legacy Conagra and $19 million of which is related to Pinnacle. Favorability in incentive compensation expense, including lower stock-based compensation expense due to a lower stock price compared to the prior-year period, was more than offset by the addition of Pinnacle-related expenses. Pension and post-retirement non-service income decreased 55.4%, or $12 million, to $10 million in the quarter, reflecting the previously-disclosed asset mix shift in the Company's pension plans. Equity method investment earnings decreased 56.2% to $13 million in the period, and adjusted equity method investment earnings decreased 48.6%. Lower commodity margins and the timing of certain customer contracts negatively impacted the performance of the Ardent Mills joint venture during the quarter. In the quarter, the effective tax rate was 21.7%, and the adjusted effective tax rate was 24.3%. In the quarter, the Company paid a dividend of $0.2125 per share. The Company remains committed to a solid investment grade credit rating. Aligned with that commitment and the leverage ratio target of 3.5 times debt to last twelve month adjusted EBITDA, the Company reduced debt by $685 million in fewer than five months after completing the Pinnacle acquisition. The Company reduced debt by $435 million in the third quarter; the Company repaid an additional $250 million of debt in the fourth quarter through March 21, 2019. As previously announced, following the conclusion of the third quarter, on February 25, 2019, the Company completed the divestiture of the Wesson oil brand, selling all assets exclusively related to the business, including a facility in Memphis, Tennessee. The Company used the net proceeds from the transaction to pay down debt in the fourth quarter. With approximately two months left in fiscal 2019, and the sale of the Wesson oil business now complete, the Company is updating its fiscal 2019 outlook. Prior guidance included Wesson for the full fiscal year. The updated organic net sales growth guidance removes Wesson for the entire fiscal year. All other metrics include Wesson's actual results only for the time period the business was owned and now exclude expected results for the remainder of the fiscal year. Adj. Diluted EPS from Cont. Ops. Organic net sales growth excludes from reported net sales the impacts of foreign exchange, divested businesses and acquisitions, including the Pinnacle acquisition (until the anniversary date of the acquisitions). All references to changes in volume and price/mix throughout this release are on an organic net sales basis. References to Legacy Conagra throughout this release exclude any income or expenses associated with the recently acquired Pinnacle business. References to adjusted items throughout this release refer to measures computed in accordance with GAAP less the impact of items impacting comparability. Items impacting comparability are income or expenses (and related tax impacts) that management believes have had, or are likely to have, a significant impact on the earnings of the applicable business segment or on the total corporation for the period in which the item is recognized, and are not indicative of the Company's core operating results. These items thus affect the comparability of underlying results from period to period. References to earnings before interest, taxes, depreciation, and amortization (EBITDA) refer to net income attributable to Conagra Brands, Inc. before the impacts of discontinued operations, income tax expense (benefit), interest expense, depreciation, and amortization. References to adjusted EBITDA refer to EBITDA before the impacts of items impacting comparability. References to pro forma items throughout this document refer to historical financial results for Pinnacle Foods prior to completion of the acquisition of Pinnacle Foods by the Company. These items have been adjusted to align with the Company's fiscal calendar and accounting policies to the extent practicable. 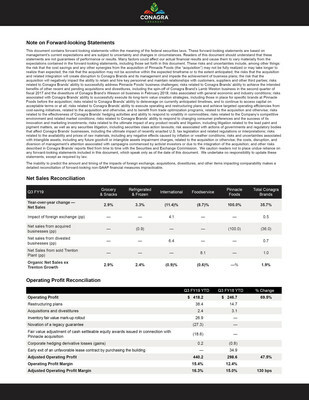 Comparison to pro forma results allow the Company to discuss and evaluate performance of the Pinnacle segment when a comparable period is not available due to the recency of the acquisition. Conagra Brands will host a webcast and conference call at 9:30 a.m. Eastern time today to discuss the results. The live audio webcast and presentation slides will be available on www.conagrabrands.com/investor-relations under Events & Presentations. The conference call may be accessed by dialing 1-877-883-0383 for participants in the continental U.S. and 1-412-902-6506 for all other participants and using passcode 0722337. Please dial in 10 to 15 minutes prior to the call start time. Following the Company's remarks, the conference call will include a question-and-answer session with the investment community. A replay of the webcast will be available on www.conagrabrands.com/investor-relations under Events & Presentations until March 21, 2020. This document contains forward-looking statements within the meaning of the federal securities laws. These forward-looking statements are based on management's current expectations and are subject to uncertainty and changes in circumstances. Readers of this document should understand that these statements are not guarantees of performance or results. Many factors could affect our actual financial results and cause them to vary materially from the expectations contained in the forward-looking statements, including those set forth in this document. These risks and uncertainties include, among other things: the risk that the cost savings and any other synergies from the acquisition of Pinnacle Foods (the "acquisition") may not be fully realized or may take longer to realize than expected; the risk that the acquisition may not be accretive within the expected timeframe or to the extent anticipated; the risks that the acquisition and related integration will create disruption to Conagra Brands and its management and impede the achievement of business plans; the risk that the acquisition will negatively impact the ability to retain and hire key personnel and maintain relationships with customers, suppliers and other third parties; risks related to Conagra Brands' ability to successfully address Pinnacle Foods' business challenges; risks related to Conagra Brands' ability to achieve the intended benefits of other recent and pending acquisitions and divestitures, including the spin-off of Conagra Brand's Lamb Weston business in the second quarter of fiscal 2017 and the divestiture of Conagra Brand's Wesson oil business in February 2019; risks associated with general economic and industry conditions; risks associated with Conagra Brands' ability to successfully execute its long-term value creation strategies, including those in place for specific brands at Pinnacle Foods before the acquisition; risks related to Conagra Brands' ability to deleverage on currently anticipated timelines, and to continue to access capital on acceptable terms or at all; risks related to Conagra Brands' ability to execute operating and restructuring plans and achieve targeted operating efficiencies from cost-saving initiatives, related to the acquisition and otherwise, and to benefit from trade optimization programs, related to the acquisition and otherwise; risks related to the effectiveness of Conagra Brands' hedging activities and ability to respond to volatility in commodities; risks related to the Company's competitive environment and related market conditions; risks related to Conagra Brands' ability to respond to changing consumer preferences and the success of its innovation and marketing investments; risks related to the ultimate impact of any product recalls and litigation, including litigation related to the lead paint and pigment matters, as well as any securities litigation, including securities class action lawsuits; risk associated with actions of governments and regulatory bodies that affect Conagra Brands' businesses, including the ultimate impact of recently enacted U.S. tax legislation and related regulations or interpretations; risks related to the availability and prices of raw materials, including any negative effects caused by inflation or weather conditions; risks and uncertainties associated with intangible assets, including any future goodwill or intangible assets impairment charges, related to the acquisition or otherwise; the costs, disruption, and diversion of management's attention associated with campaigns commenced by activist investors or due to the integration of the acquisition; and other risks described in Conagra Brands' reports filed from time to time with the Securities and Exchange Commission. We caution readers not to place undue reliance on any forward-looking statements included in this document, which speak only as of the date of this document. We undertake no responsibility to update these statements, except as required by law. This document includes certain non-GAAP financial measures, including adjusted diluted EPS from continuing operations, organic net sales, adjusted gross profit, adjusted operating profit, adjusted gross margin, adjusted SG&A, adjusted corporate expenses, adjusted equity method investment earnings, adjusted operating margin, adjusted effective tax rate and adjusted EBITDA. Management considers GAAP financial measures as well as such non-GAAP financial information in its evaluation of the Company's financial statements and believes these non-GAAP measures provide useful supplemental information to assess the Company's operating performance and financial position. These measures should be viewed in addition to, and not in lieu of, the Company's diluted earnings per share, operating performance and financial measures as calculated in accordance with GAAP. Certain of these non-GAAP measures, such as organic net sales, adjusted gross margin, adjusted operating margin, adjusted effective tax rate, adjusted net interest expense, and adjusted diluted EPS from continuing operations, are forward-looking. Historically, the Company has excluded the impact of certain items impacting comparability, such as, but not limited to, restructuring expenses, the impact of the extinguishment of debt, the impact of foreign exchange, the impact of acquisitions and divestitures, hedging gains and losses, impairment charges, the impact of legacy legal contingencies, and the impact of unusual tax items, from the non-GAAP financial measures it presents. Reconciliations of these forward-looking non-GAAP financial measures to the most directly comparable GAAP financial measures are not provided because the Company is unable to provide such reconciliations without unreasonable effort, due to the uncertainty and inherent difficulty of predicting the occurrence and the financial impact of such items impacting comparability and the periods in which such items may be recognized. For the same reasons, the Company is unable to address the probable significance of the unavailable information, which could be material to future results. 1 Operating profit is derived from taking Income from continuing operations before income taxes and equity method investment earnings, adding back Interest expense, net and removing Pension and postretirement non-service income. 1 Excludes comparability items related to depreciation.